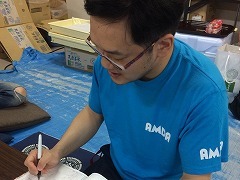 More than one month has passed since AMDA began the dispatch of a nurse to Mabi Community Center Sono Branch (Sono Community Center) on 21 July. This facility is being used as a temporary home for those affected, including some senior citizens who were using a small-scale multipurpose home in Mabicho that was damaged by the recent floods. That small-scale multipurpose home was a modular building where the occupants could receive individual care enriched by their own personality and lifestyle rhythm. At Sono Community Center, however, they continue their group evacuation lifestyle. 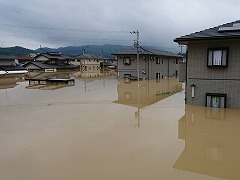 On 23 August, Typhoon Cimaron (Typhoon 20) approached Okayama. 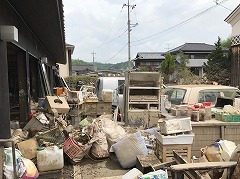 In response to this, the Kurashiki City government released an instruction for the elderly in the Mabi area to evacuate once again. Due to this, the AMDA nurse stayed at the community center for the duration. As a result of the typhoon warning, four more people came to evacuate at the center. Overnight, the AMDA nurse helped show evacuees to designated evacuation centers. 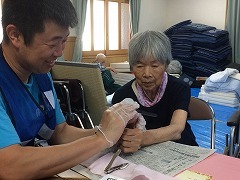 The adverse weather cleared the next morning, and the AMDA nurse handed the facility over to a public health nurse from Kurashiki City. The good cooperation between public health nurses and various groups is continuing in the area. One senior citizen who is evacuating said, “I could live an independent lifestyle before I started evacuating. I lived by myself and I could drive a car. Now, however, I’ve lost my car to this disaster, and living in such evacuation conditions with diabetes, my dietary and exercise balance is in disarray and I’m having trouble with my legs. I need to see a doctor.” There was a need, once again, for evacuees to receive a nursing-care service, so DWAT (the Disaster Welfare Assistance Team), teams of public health nurses from outside of Okayama and the team of public health nurses from Kurashiki City have been cooperating with clinics in the area that have reopened to provide the people of Mabi with the help that they need. Additionally, they have also received counselling from JRAT (Japan Rehabilitation Association Team) Speech Therapists regarding the prevention of choking while eating. 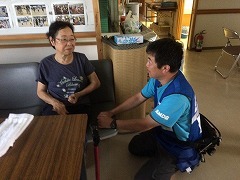 *AMDA ended its initial Emergency Response phase on 15 August, but the support activities of the AMDA nurse at Sono Community Center will continue up until 31 August.